We have definitely seen this trend in our practice. We are seeing a large number of chickens with the numbers increasing significantly over the past year. We have treated a wide variety of disease conditions in poultry as well as numerous surgical procedures. Most commonly performed surgeries are related to the reproductive tract, such as egg removal from egg bound hens or salpingectomies (removal of the reproductive tract of a hen) in birds with serious reproductive conditions. We also work with various rescue organizations which save chickens, "Free from Harm" (executive director Robert Grillo) is a particularly motivated and very effective group. We also work with Jennifer Murtoff who is an Urban Chicken Specialist. So more people are becoming involved to provide care for these wonderful birds, which are sadly underestimated. Carolyn Hecht, who keeps six chickens as pets on Long Island, has not been able to find a vet who will see chickens. As a result, she turns to the web and fellow chicken owners for advice. Seeking medical help for her beloved pet, Edie, who had fallen ill, Martha Lazar quickly grew frustrated. "I had a terrible time finding a vet here that would see a chicken," says Ms. Lazar, a 45-year-old freelance photographer and casting director in Brooklyn, N.Y. She eventually found an animal doctor across the bridge in Manhattan who knew parrots, but the knowledge didn't transfer. Some $300 later, Edie was still in distress. Finally, after Ms. Lazar repeatedly poked around the bird's nether-feathers, a stuck egg popped out. Blaze the rooster guards his flock at the home of Kathy Shea Mormino. "If there's something wrong with a commercial chicken, it's 'Cut its head off and find out what's wrong with the flock'," says Cheryl Greenacre, an associate professor of avian and zoological medicine at the University of Tennessee College of Veterinary Medicine in Knoxville. That doesn't roost well with backyard bird fans, many of whom hopped on the poultry bandwagon in search of self-sufficient, grow-local lifestyles. Rob Ludlow, who runs the popular site backyardchickens.com, says it "continues to grow like crazy," with membership recently topping 222,000. The U.S. Department of Agriculture doesn't track statistics on backyard husbandry, a spokesman said. Some people are going full farmer, collecting eggs and eating birds, while others are more "helicopter chicken parents," says Ms. Lazar, who recently offered tips for battling chicken mites on her blog, brooklynfeed.com. (Her chicken Edie eventually succumbed to health troubles.) Owners may start with agricultural intentions, but once the birds get whimsical names such as Ellen DeHeneres and Yolko, they become more like family than food. Indeed, diapered chickens are pecking around houses as indoor pets. Or they have their own fancy digs: Gourmet cookware purveyor Williams-Sonoma sells a $1,499.95 coop made of red cedar "custom milled by a local, family-run sawmill" in Washington state. Elsewhere, fans of both Middle-earth and poultry can buy coops that look like Hobbit homes. Some owners go the extra medical mile. Marli Lintner, a vet in Lake Oswego, Ore., with chicken expertise, says she commonly performs hysterectomies and stitches up fowl that have been wounded by predators. In Tennessee, Dr. Greenacre performed a surgery last month to remove a clutch of stuck eggs from Dolly Poulet, a petite, white chicken. Owner Stephen Brown, a 40-year-old in Knoxville who runs giftware company Glitterville, spent roughly $2,000 but was thrilled with the outcome after getting spurned by other vets, one of whom told him chickens were "disposable" livestock. But Dolly lives a life far from the henhouse. Actress and poultry enthusiast Tori Spelling, with whom Mr. Brown worked on the TV show "Craft Wars," inspired him to get his first chicken, he said. Dolly sleeps in a basket near her owner, has her own Twitter feed and travels in a Ralph Lauren tote bag. "She laid her first egg in the bed of a Ritz-Carlton in Atlanta," Mr. Brown says. 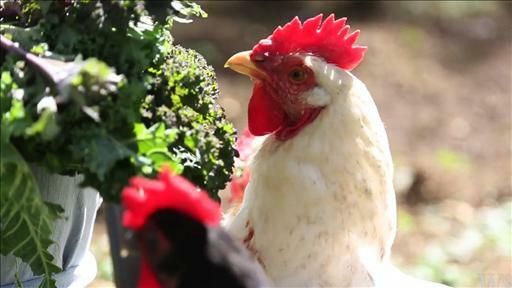 A spokeswoman for the two Ritz-Carlton hotels in Atlanta said they had no knowledge of the chicken laying an egg there. Meantime, Dr. Greenacre's hospital recently saw a turkey beset by seizures and respiratory problems. It got an MRI. In another case, vets at the same hospital pulled 97 cents in change from a duck. 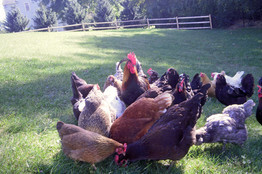 But many poultry lovers don't live near specialists or become budget-conscious when their flocks grow. Enter the Internet, where chicken-centric sites are rife with health tips, ranging from basic care to grave diseases. One discussion on backyardchickens.com delved into advice for diagnosing and treating "vent gleet," an unsightly infection. Somebody wanted to know whether a chicken missing feathers was getting bullied, or was merely molting. Owners also frequently discuss over-the-counter drugs for other ailments, or how to surgically empty the "crop," a blockage-prone food-storage pouch. Experienced vets cringe at online treatments, some of which they say are downright flighty. But Kathy Shea Mormino, a 45-year-old chicken owner in northern Connecticut, says necessity feeds the DIY culture. She shares care tips on her website, the-chicken-chick.com, such as how to Super Glue cracked beaks and treat an infectious problem called bumblefoot. At-home surgery isn't for the faint of stomach, yet Ms. Mormino's YouTube bumblefoot demonstration recently had more than 20,000 hits. A lawyer, she is careful to warn that she isn't giving professional medical advice. On a recent afternoon in Ms. Mormino's manicured backyard, about 40 chickens including Ms. DeHeneres and Ally McBeak strutted around, scratching the ground or tailing her for food. Blaze, a big rooster with black and copper feathers, was on high alert, possibly for local bobcats. Blaze also took occasional breaks for not-so-private moments with his favorite hens, some of which wore capes to protect from his claws. He was nearly felled in June by a fast-moving infection. It started with an irritated eye that quickly swelled shut, and Blaze was "in my office, in the dog bed, just flat out laying down," Ms. Mormino says. Out of her depth, she worked the phones searching for medical help. She found some from local vets eventually, and Blaze was saved, but the process was frustrating. "The challenge is to find someone who's trained and experienced," Ms. Mormino says. But chicken pros say this is changing. Dr. Greenacre, who is wrapping up a book on backyard birds, says the trend is a hot topic at vet conferences. "We're responding to the need," she says. Meantime, owners such as Carolyn Hecht, a 73-year-old retiree on New York's Long Island, are ready to take poultry health into their own hands. She acquired her small flock, including hens Laverne and Shirley, a few years ago to soothe her "total empty-nest syndrome," and was also surprised when local vets turned down the birds. They have been healthy so far, but "I just received my shipment of 10 scalpels," she says. It's one of the most intriguing parts ever! I'll definitely take into account your educational report.